Aliens can kiss her axe. Royal by birth, Arixa rejected palace life at age nineteen to found her own war band, the Dawn, and ride the steppe in defense of the growing Scythian capital. When a fateful encounter leaves Arixa with knowledge that alien tyrants are en route to devastate all the cities of Earth, she sets out not only to save her homeland but also to do the unthinkable. She will strike a blow against the enemies of humanity. At any cost. 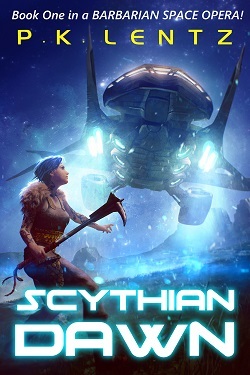 Scythian Dawn is the launching point of a ‘Barbarian Space Opera’ which sees tattooed, ax-wielding riders of the steppe wage high-tech rebellion against a galactic empire. Expect adventure, betrayal, starship duels, alien locales, jumps to hyperspace and iron war-picks punching holes in space armor. Get aboard now!